A galette is a sort of free form tart or pie—just as delicious, but in my opinion, the crust is easier to make since it does not have to turn out perfectly (my crusts are always super flaky and yummy but they always shrink! If you have any tips, let me know). This recipe comes from Lydie Marshall and her Chez Nous cookbook. Way back when I first lived in New York City (the 1970s! ), I worked with a woman who took cooking classes from Lydie Marshall. Lydie was working on a cookbook at the time, and my colleague would be sent home with recipes to try out. She shared a few with me, and ever since I’ve been a fan of Lydie’s. I even learned to like brussell sprouts thanks to her recipe which included copious amounts of butter, bacon and cream. For topping: 1 cup sour cream mixed with 1 tablespoon sugar (the French way to serve it) or whipped cream or even vanilla ice cream. Roll the dough into a rough circle about of 14-inches and trim to a 13-inch circle. Refrigerate on a cookie sheet until ready to use. I found that lining the cookie sheet with a piece of parchment paper was necessary otherwise the tart would stick. In a small pan, heat the apricot jam with 2 teaspoons water until it thins out a bit. Brush half of the warm jam over the dough circle. Arrange slightly overlapping slices of apple on the dough, leaving a one inch border. Fold the free edge over the apples. You can be as OCD as you want about this, but it’s not really necessary. The apples cook up, and they’ll be fine even if a few are out of line or your design isn’t perfect. Brush the remaining jam over the apples and the pastry edge. Sprinkle the sugar over the apples and scatter butter shavings on top. Lower oven temperature to 400 degrees and bake on the bottom rack for 30 minutes until bottom crust is golden. Mine took a few more minutes to get nice and brown. Serve with sweetened sour cream or whipped cream if desired. 8 tablespoons (1 stick) unsalted butter – cut butter into small pieces and put in freezer for 5 minutes. 2 to 3 tablespoons of cold water. Combine butter and flour in the bowl of a food processor and process until mixture looks like cornmeal. Add 2 to 3 tablespoons of water depending on weather and humidity and process briefly. Form into a ball and then flatten into a patty. I was able to roll this out right away, but if it feels too sticky, just pop it into the refrigerator for a few minutes. This isn't exactly low-calorie fare, but I'm sure my character, Gigi Fitzgerald,from my upcoming Gourmet De-Lite Series would agree it's worth the splurge! 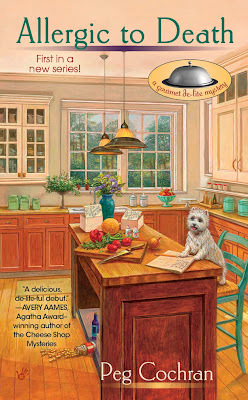 The first book in the series, Allergic to Death, will be out August 2012! And I know I've told you before, but that cover is stunning! Can't wait for the new book. Thanks, Lucy! Yes, it's super easy to make, even on the spur of the moment. If you have apples, you probably have the other ingredients on hand and are good to go. I LOVE LOVE my cover! I'm so lucky. Fabulous artist. Peg, this is my kind of food. I can just taste it. And when you get right down to it the ingredients are pretty basic. I think I have them all on hand. Can't wait to try it! And I love your cover, too! Peg, is this ever pretty! I mean pretty! Can't wait to try it (gluten-free, of course), but what fun!